Writing Prompts are a great addition to a literacy center. Journal writing in preschool can be a good way to help children develop communication skills. They can practice phonetic spelling and creative thinking. To download these writing prompt templates, as well as 8 others, visit Teachers Pay Teachers. Show your child the many ways you use writing every day. Call attention to the notes, lists, forms, and letters that you create on a daily basis. When young children have the opportunity to watch adults use writing in their everyday lives, it demonstrates the importance of the written word. Surround your child with signs. Seeing printed words around the house helps your child understand that there is a connection between spoken language and written language. You can label objects in your child’s room, such as “books” or “door.” Making a sign for your child’s bedroom door or a “mailbox” for special notes also draws your child’s attention to the printed word. Spend time “writing” with your child. Provide a wide range of writing supplies–different types of paper, notepads, envelopes, pens, crayons, and markers. Make these supplies available regularly for your child’s use and join in as she draws and writes. As parents and caregivers write with young children, they can also help them learn to form letters. While younger children are not able to form letters yet, they will still enjoy “scribble writing” in ways that mirror adult uses of writing. Write down what your child says about his drawings. As your child is drawing or coloring, record what he says. You can also prompt your child to “tell a story” about the pictures he creates, cuts out, or sees around him and write those down as well. Older children enjoy making their own books that combine pictures and writing (either their own writing or their words dictated to an adult). You can help “publish” your child’s stories by typing them into a computer and printing them out for children to illustrate. Encourage your child to share stories with others by showing them and reading them aloud. Make Homemade Bubbles and go outside to blow bubbles or play bubble catch (one child blows bubbles and other child tries to catch them with hands or a butterfly net). 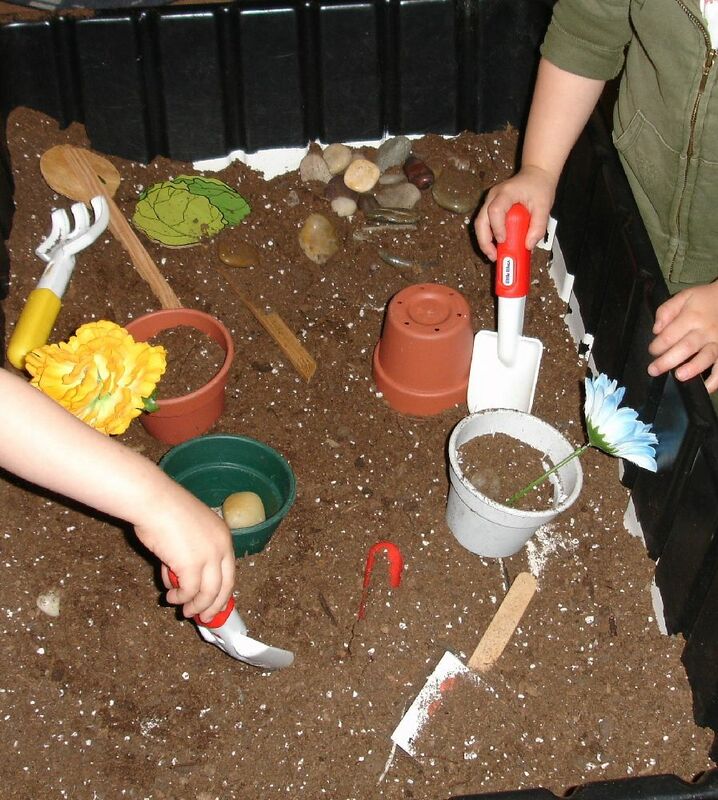 Create a gardening Sensory Table or Bin: Add dirt, plastic gardening tools, pots, seeds, and gardening gloves. Include some large dried beans…they will sprout over a weekend quickly. What is Missing? : During circle time, place several spring items on a tray and let the children look at the items for 30 seconds. Place a cloth over the items, then take one or more items away. let the children guess which item(s) are missing. Item Suggestions: Umbrella, garden shovel, plant, flower, rain coat, flower seeds, etc.